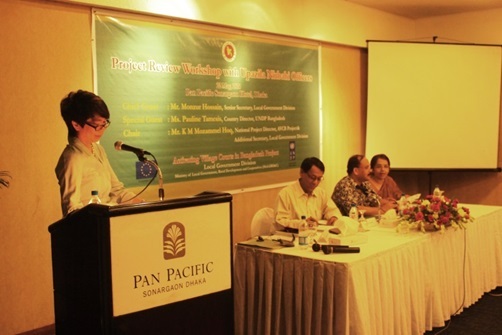 Activating Village Courts in Bangladesh Project organised a day-long review workshop with Upazila Nirbahi Officers on May 22, 2014 at the Pan Pacific Sonargaon Hotel, Dhaka. Mr. Monzur Hossain, Senior Secretary of Local Government Division graced the workshop as the Chief Guest while Ms. Pauline Tamesis, Country Director, UNDP Bangladesh were present as Special Guest. Mr. KM Mozammel Hoq, Additional Secretary of LGD and NPD of AVCB Project chaired the inaugural session. According to the Village Courts (amendment) Act 2013, UNOs are the main supervisory authorities at the field level with critical roles in ensuring that UP Chairmen run the Village Courts as per law and rules regularly for ensuring people's access to justice at doorsteps. The workshop explored and documented lessons learning from UNOs, identified issues and challenges in implementing Phase I of the project, and also collected recommendations and suggestions for next phase designing. A total of 45 UNOs from 14 Districts covering six Divisions took part while senior officials from Local Government Divisions together with project officials attended the workshop. Participants instigated discussions on functioning of VCMCs, VC performances and challenges and way forwards with a view to formulate the second phase while Project Coordinator Sarder M Asaduzzaman of AVCB Project facilitated discussions in addition to respective Joint Secretary and Deputy Secretary of LGD. The Chief Guest reiterated the government’s commitment for the Project and also shared the information of financial commitment for the next phase. Ms. Pauline Tamesis, Country Director, UNDP Bangladesh said, there is plenty of potential of Village Courts in strengthening local justice system in the country and reiterated about continuation of current partnership with GOB and EU for scaling up. She also referred to the remarks made by Mr. Haoliang Xu, Assistant Administrator of UNDP, and Ms. Helen Clark, Administrator of UNDP on Village Courts service recently in two different occasions.